Thanks to A Mothers Ramblings I get a lot of things sent to me to review or because PR's think I might like something based on having worked with me before. One of the things that I get the PR version of but hardly talk about is the Glossybox boxes which I normally pass to my sister after having a quick nose inside, because I don't do makeup and so the things aren't really any use to me and I think it's a shame for them to go to waste. 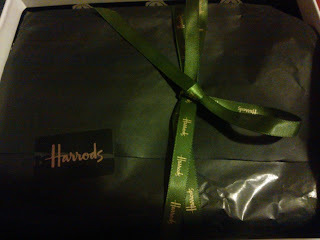 This month however when I looked inside and saw that it was a special Harrods box I knew my sister wasn't going to get a look in! I just put some of the Juicytube on, it really is so toffee smelling. I feel like I've just eaten a toffee! I've smelt everything else in the box and they all smell fab, so I can't wait to use them, especially as there isn't any make up! I'll remember! Love the juicy tube, I'm a big convert. I saw so many saying it wasn't great, but I really loved it. For me it was the first month where I actually could use what was included without having to think.